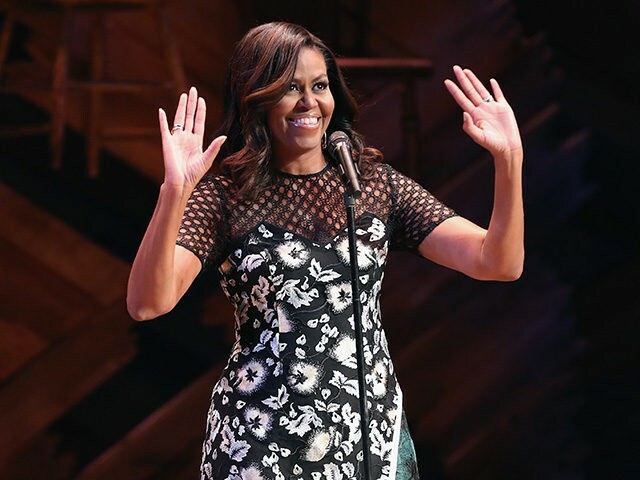 First Lady Michelle Obama served as host at a Broadway concert for the spouses of U.N. leaders as part of her Let Girls Learn initiative that promotes the education of girls in countries whose cultural traditions prevent their access to higher learning. The event, held at the Bernard Jacobs Theater in New York City on Monday, was emceed by late-night talk show host Stephen Colbert and, according to the White House, coordinated with the United Nations General Assembly Spousal Program. As the Associated Press reports, Broadway stars performed tunes from shows that feature female characters, such as The Color Purple, Waitress, Wicked, and Beautiful: The Carole King Musical. Mrs. Obama said that while she has no authority to pass laws or to issue executive orders, “in just a year and a half, through Let Girls Learn, we’ve established partnerships with nearly 80 companies and organizations that are committing money, resources and expertise” to her initiative. The First Lady added that the program is collaborating with Canada, Mexico, the Nordic countries, Japan, South Korea, and the United Kingdom. “The U.S. is investing over half a billion dollars more, and running Let Girls Learn programs in 40 countries,” she added.